Emerald Glen children mix in games with learning after school. Three days a week the community center at Emerald Glen Apartments hums loudly from the after-school activity of elementary and middle school students. “I like to play games, go on the computer and the arts and crafts,” said Aweys Aliyow, a fourth-grader with three siblings in the program. “I love to play cup games,” said Ladan Yusuf, a fifth grader. Up to 30 children benefit from the activities coordinated by Ethiopian Tewahedo Social Services (ETSS), a non-profit social service agency geared to working with immigrant communities. 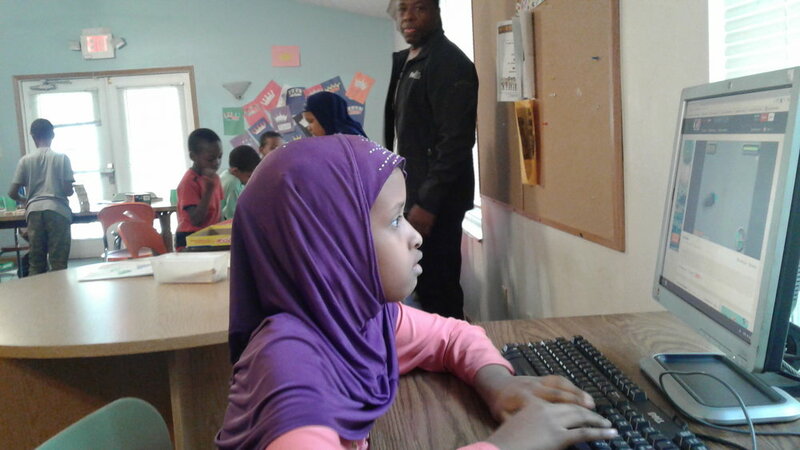 Ladan Yusuf plays computer game in Emerald Glen community center. ETSS, a Columbus Foundation Top-5 Non-Profit to Watch, provided camp activities for the first time at Emerald this past summer to the largely Somali immigrant community at Emerald Glen, a Homeport apartment complex on the West Side of Columbus. When ETSS counselors returned in mid-September to prepare for an after-school program, the children swarmed them. “When are we starting?” the children asked. “When we told them, they all showed up,” said ETSS Site Coordinator Saynab Yusuf. Programming is supposed to begin at 3:30, but Yusuf said the children get home from school around 3 p.m. and head straight to the community center. “I let them come in early,” she said. The routine involves the children doing their homework for the first 20 minutes. And if they don’t have homework they read. “Each day is different,” Yusuf said. One day the focus Is Math, the next writing. Thursday is “enrichment,” where the children learn about health or nutrition. There is also social and emotional learning opportunities, where children share stories or learn about their family’s native country or American culture. After school cards at Emerald Glen with ETSS Site Coordinator Saynab Yusuf, right. The children are also monitored for behavior. Three warnings and they are sent home with a letter that parents must sign. Staffing of ETSS at Emerald Glen is funded by Franklin County. “ETSS’S vision is to see a world where refugees and immigrants are welcomed, and receive support services to enable them to be healthy and self-reliant contributing members of the American Society,” said ETSS Lead Youth Program Coordinator Lilu Terefe. Alex Romstedt, Homeport’s Director of Resident Services, said he is looking forward to seeing how the Homeport-ETSS partnership expands and grows. “They’ve been great to work with, providing much needed programs and services that help our New American families become successful,” Romstedt said.